After a photograph showing several potholes along the 20-month-old, $605M La Parfaite Harmonie Access road appeared on the front page of the Kaieteur News’ Wednesday Edition captioned, “Road built to last 20 years crumbles in 20 months,” the contractor who carried out works on the project, has responded. The Managing Director of Gaico Construction Inc., Komal Singh, responded immediately after the photograph and article was published. “We did recognize over the last year that there were some potholes developing at some isolated areas. We can count them on our fingers. These came about because of many reasons,” he said. The company was constructing the road in an area where rice farming was the prime activity. He also added that during the rainy season while works were being carried out, tractors were traversing on the roadway with mud. Singh added that in some cases, this happened immediately after paving was completed. “We had to allow the farmer to reap his rice and prepare his land and at the same time, we were under pressure to get the job done.” Animals were also trampling on the road immediately after the workers would have paved the road,” Singh added. Singh opined that this was the main reason for the asphalt to show weakness in some of those isolated areas. “Nothing is wrong with the structural integrity of the road. Some 99% of the road is structurally sound and shows no sign of any failure. Even though the defects liability period is up, we have been maintaining this road in those weak areas since we are aware of the reason and expect to see some of those spot failures. “We don’t expect any further areas to show failure. This road was scheduled to do maintenance at our cost since last week but due to the rain we were unable to do the fix,” Singh stated in an email. He also added that the company has a standard policy for any road it would have fully constructed and that is, to maintain the same road for ten years correcting any failure arising from construction. Singh concluded by saying that the entire road is not in trouble but there are some spot failures. 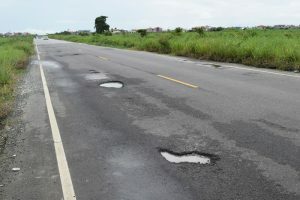 Potholes were observed on the three-kilometer alternative access road to La Parfaite Harmonie which cost $605M. The road was touted to last for some 20 years. The highway was opened to vehicular traffic on September 6, 2014. According to a plaque at the eastern end of the thoroughfare, it was commissioned by the former President of Guyana, Donald Ramotar and former Minister of Housing and Water, Irfaan Ali.